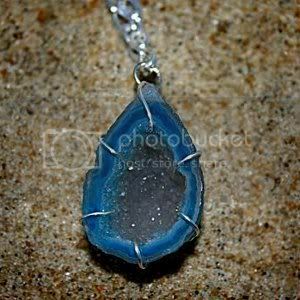 This unique druzy geode necklace by Jessica of esoteric HEARTS now sparkles up from the depths of my treasure trove, courtesy of a jewelry giveaway on the We Know Stuff blog. Although I own a small collection of decorative rocks, this is my very first piece of geode jewelry! Silver wire clutches the blue geode to a silver plated chain with a lobster claw clasp. The back of the stone is as natural as if it had just tumbled ashore from the bottom of the sea. The front is flat and polished to a smooth shine. The inside glitters with the raw crystals that took millions of years to take shape. Amazing, right? Jessica designs for the not so ordinary girl. Several of her extraordinary pendants feature drusy quartz gemstones, from citrine to my favorite, amethyst. She is also very inspired by the beach. In addition to nautical necklaces and earrings, she offers shell and starfish hair accessories. Many of her pieces would make fantastic additions to mermaid costumes. Stopping by from Handmade Wednesday to follow your blog and say hi! !